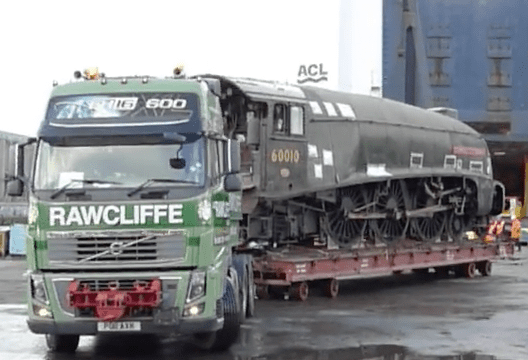 Many said it would never happen, but the repatriation of the two exiled A4 Pacifics from North America made British railway history at Liverpool Docks on Wednesday October 3. No. 60010 Dominion of Canada is seen arriving back on British soil around 8.20pm. Comment on our videos: register or login to add your comments to our video features below. The director of the National Railway Museum, Steve Davies, who came up with the idea of reuniting all six A4s to celebrate the 75th anniversary of sister engine Mallard’s world steam speed record run in 1938, said the pair had been brought back to England for a “family reunion”. “We wanted to do something really special to mark the 75th anniversary of Mallard breaking the world speed record and what could be more spectacular than an international family reunion. “When these mighty machines were exported across the Atlantic, no-one thought they would ever come back – now they are finally here.